Chip Somodevilla/Getty ImagesSen. Lindsey Graham of South Carolina. Sen. Lindsey Graham of South Carolina shrugged off a protester with a quip as he walked to his car. Graham appeared unfazed by the shouting protester and encouraged her visit his home state. Hundreds of protesters showed up in force this week at Senate office buildings amid the procedural vote for Supreme Court nominee Judge Brett Kavanaugh on Friday. 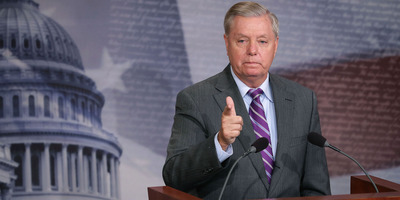 Sen. Lindsey Graham of South Carolina shrugged off a protester with a quip of his own as he walked to his car at Capitol Hill on Friday. A female protester followed closely behind Graham’s entourage shouting, “your own white privilege patriarchy,” and threatened to vote him out of office. Graham appeared unfazed by the protester’s remarks and encouraged her visit his home state. Hundreds of protesters showed up in force this week at Senate office buildings amid the procedural vote for Supreme Court nominee Judge Brett Kavanaugh on Friday. Final voting is expected to be held on Saturday. Despite the protests, the Senate primarily voted on party lines and moved to confirm Kavanaugh, who has been accused of sexual misconduct by numerous women. Critics have lambasted Republican lawmakers and Democratic Sen. Joe Manchin of West Virginia for their 51-49 procedural vote, which all but guarantees Kavanaugh’s confirmation.